If you love to play video games but you haven't already purchased a Nintendo Wii then you better wait a few more days. 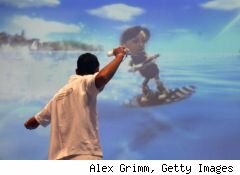 Nintendo announced today that its popular Nintendo Wii console will be $50 cheaper starting on Sunday. The release also confirmed that when the latest Mario Bros game, "The New Super Mario Bros." comes out for the Wii in November that fans will get to play as the Mario Bros at the same time; a first for the series. By dropping the Wii down to $199 Nintendo isn't just making it cheaper to get your motion sensing gaming on, it's matching the recent price drops to the Xbox 360 and the new slimmer Sony PlayStation 3. Last month Microsoft cut the price of its top end Xbox 360, the Elite, to $299 which is even cheaper thanks to a $50 rebate which is valid until Oct. 6. The new PS3 slim which launched earlier this month is $299; a drop of $100. One thing to remember when buying a new console is that if you're buying for a Christmas present you may want to wait a few weeks until Holiday Bundles come out. In the past these bundles have included two games, albeit older ones, for the same price as the consoles. The only console that you may want to buy sooner than that is the Xbox 360 since the bundled games, Pure and Lego Batman, can be purchased used for less than the $50 rebate.